Glow in the Dark Non Skid Tape in 1", 2", 4", and 6" widths. Rolls are 60 feet long. 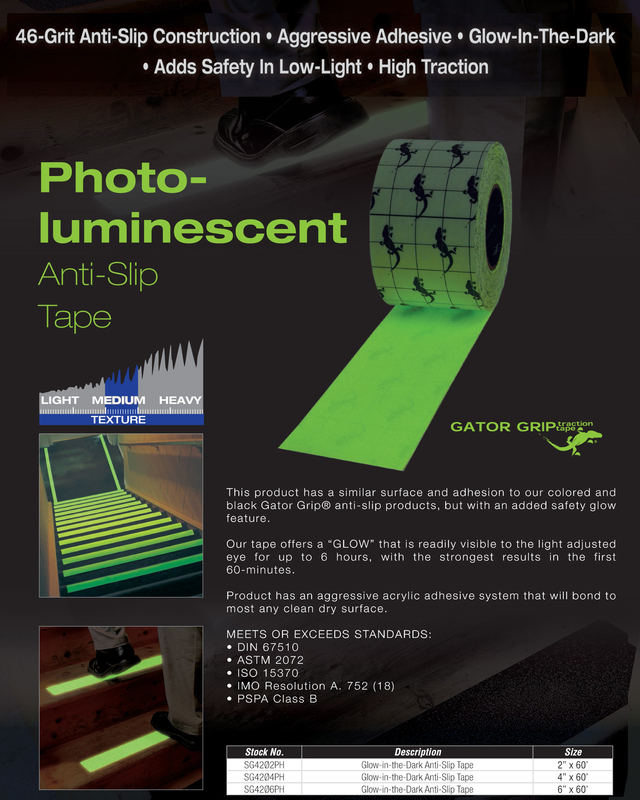 Our photo luminescent non skid tape has a 46 grit anti slip surface and an aggressive adhesive. It charges itself when exposed to light and glows for up to 4-6 hours to the light adjusted eye and is brightest for the first 30 - 60 minutes. Great for applications like dark stairwells. An excellent and cost effective choice for commercial, industrial and residential indoor and outdoor non slip tape applications. Suitable for recreational areas such as ramps, playgrounds, pool areas, RV's, stairs, work areas, ladders, snowmobiles, scooters, construction machinery,vehicles, machine shops, hazardous floors, industrial equipment, lawn equipment, boat decks, trucks and trailers. Our anti slip safety tapes MEET OR EXCEED: OSHA Spec 1910.24 Stair tread, OSHA Spec 1910.26 Ladder Rungs, Military Spec Mil-D-17951E-Ships, Military Spec Mil-W-5044C-Type IV, Motor Vehicle Safety Standard #302. Copyright © 2009-2019 CLOSED UNTIL APRIL 29. All rights reserved.